And what about those people out there who think they are fat, but are not. Will this help their self image? I'm afraid something like this might just give bulimic and anorexics more fuel for their fire. Can you imagine this size 2 college student doing her laundry and finding one of these tiny shirts, then looking herself over and deciding she really should lose more weight? What a huge waste of money and resources. This is one of the most disgusting tactics I've ever heard of. How smug can they get? I think we can expect more of this kind of "nannyism", no matter who is in the White House. Government intrusiveness into all aspects of our personal lives is already out of hand and is only getting worse. The excuse is that government is only looking out for our welfare, but we all know the saying about good intentions paving the road to you-know-where. Shame me into losing weight? Why didn't society think of this years ago? we should start shaming overweight children as soon as they are old enough to understand that they are bad people for being too big. We could continue this for their entire lives, letting them know that in every way they don't measure up (intentional pun). Oh wait this program is already in place, never mind. So now our tax dollars are going toward insulting fat people? What a brilliant idea. To whom do we write to express our disapproval? This is my first time on this blog and I really like the content ; ) Have you guys checked out thedailyskinny.com yet? It's mainly for healthy weight loss, but they also get into some great nutrition and exercise advice. You have to step back and just ask, seriously: did any human being who was part of this decision, actually think this would HELP? 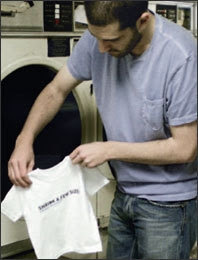 "Let's tell the poor people (-- even middle class, don't use public laundry facilities) they're too fat, by putting child-sized clothes in the dryers for them to find and be insulted by." What brain-damaged person actually thought this would be effective? Funny in a sick way, for those into that, maybe. Publicity, maybe. But effective? Not at all, probably more the opposite. How much of that money could have gone to a public gardening project, or a healthy snacks for kids program, or whatever?